Caledonian MacBrayne's car ferry JUPITER is seen here limping back to Gourock Pier this morning, after suffering from mechanical problems while on her first sailing of the day to Dunoon. To take her place, the chartered catamaran ALI CAT was brought out of weekend rest in the James Watt Dock, and she took three crossings at 1020, 1120 and 1220. 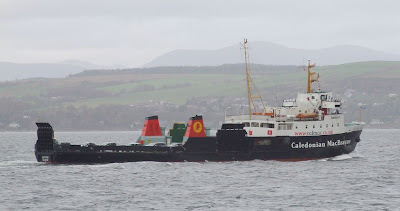 ALI CAT, built in 1999 for Solent and Wightline Cruises on the Isle of Wight, has spent the last five years on charter to CalMac, giving additional passenger-only morning and evening sailings to Dunoon, Monday to Friday. Passing behind her is the container ship MERIWA, which had been berthed at Ocean Terminal overnight. While ALI CAT on was on crossing, the crew of JUPITER was despatched to Rosneath, where SATURN had been lying spare since completing her docking a couple of weeks ago. She left Rosneath shortly before midday, and took over the Dunoon roster at 1320, allowing ALI CAT to return to Greenock. SATURN will remain on the run until JUPITER is repaired.